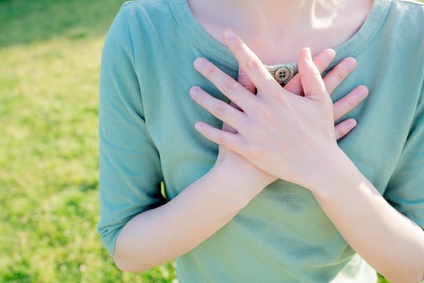 The chest cavity contains several vital organs, namely the heart and lungs. Therefore chest pain may be a symptom of a disease within these organs. It can be fatal, sometimes even within minutes. However, there are a host of other organs in the chest cavity that are not vital. It is therefore important to understad that chest pain is not always serious or life-threatening. 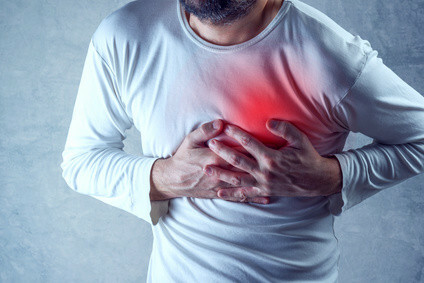 Pain in the middle of the chest (central chest pain) is usually a cause for concern as it is often thought to be cardiac chest pain which may have serious implications. However, there are a number of causes of central chest pain that are unrelated to the heart or great blood vessels, but may be equally as serious or even benign in nature. As a general rule of thumb, chest pain associated with difficulty breathing, dizziness and fainting should be treated as a medical emergency and immediate medical attention is needed. Other symptoms like pain radiating down the arm, especially the left arm and excessive sweating for no known cause should also warrant a medical assessment. While pain in the middle of the chest may be related to these structures, it is not uncommon for pain to radiate or refer from other regions, like the upper middle abdominal area (epigastric region). The concomitant signs and symptoms are of significant value when assessing the possible causes of central chest pain. The following video was produced by the Health Hype team. The more common causes of central chest pain associated with the chest wall are often related to the chest muscles and the breastbone (sternum) and related skeletal structures like the costal cartilages and ribs. Muscle strain is possibly the leading cause of acute chest wall pain and may be related to strenuous activities. Breastbone pain may be more serious and longer lasting and can vary from fractures to growths, inflammation of the costal cartilages and joints (costochondritis) or injury linked to blunt force trauma without fractures. These causes are discussed further under chest wall pain. Common symptoms include chest pain when breathing, especially upon inspiration, moving and coughing, tenderness of the chest and occasionally skin symptoms and localized swelling. An acute myocardial infarction (heart attack) should always be excluded when there is a sudden chest pain radiating down the arm, associated with breathlessness, sweating, nausea and dizziness. These patients also tend to be extremely anxious with a feeling of impending doom and in the typical presentation, clutching the chest. High risk patients, especially those diagnosed with angina pectoris, need emergency medical care. Other conditions that may initially be less severe in clinical presentation but equally serious in acute settings includes pericarditis, heart valve disease, aortic dissection and pulmonary embolism. These cardiac causes of centrl chest pain may not always present in what is thought of as typical. In fact some of these conditions may not present with pain and can therefore be misleading. Some of the common symptoms includes varying degrees of breathlessness, dizziness, nausea and vomiting or fainting. Symptoms such as coughing up blood-tinged froth is indicative of conditions like pulmonary embolism whereas chest pain that ease when leaning forward may be a strong indication of pericarditis. The most likely respiratory cause for pain in the middle of the chest is tracheitis which is inflammation of the trachea (windpipe). While bronchitis may also be responsible, it is not always associated with significant pain except in the case of bronchial carcinoma (cancer). Most respiratory conditions present with cough and sputum and are usually infectious in nature. The infection may affect surrounding parts of the respiratory system and other symptoms like a hoarse voice when the larynx is involved and pulmonary edema (fluid in the lungs) when the lungs are affected may also be present. Inflammation of the esophagus (esophagitis) may occur for a number of reasons but the most common cause is related to acid reflux. This can cause acute chest pain that may mimic heart attack pain in acute cases and a dull, persistent ache of the central chest may be present in chronic cases (GERD). 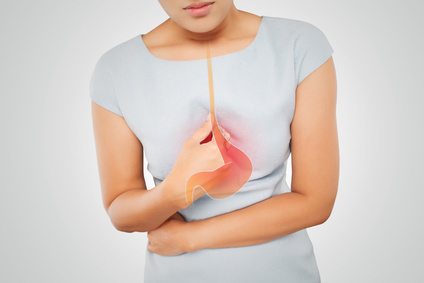 There are various other types of esophagitis due to different causes that may also be responsible. Esophageal ulcers or an esophageal tear may also be responsible for central chest pain. Gastrointestinal chest pain can arise with host of esophageal problems and may also be sometimes related to upper stomach diseases. It usually presents with pain when hungry, during or after eating, along with nausea, vomiting and a change in appetite.